The Country Music Awards show is one of my favorites! This is mostly due to the fact that (as a song writer) I feel that lyrically country music has the best standard. Last night's CMAs aired with some really super cool performances, honest acceptance speeches, and of course our fave hosts- Carrie Underwood and Brad Paisley. 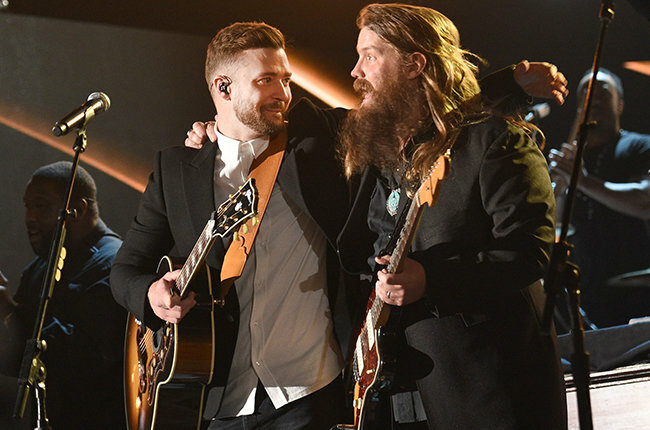 While there were many notable (and quotable) moments last night, by far Justin Timberlake's performance with Chris Stapleton stole the show! Both of these boys sing DOWN on their own. I mean. Take Timberlake and his Tennessee upbringing paired with Stapleton's Kentucky bred sound, and you pretty much have the potential for church to happen. Last night, church happened. Stapleton explained that he'd reached out to Justin (who has said how much of a fan he is of the rising country star), and Justin didn't hesitate a bit. The two gave a double whammy performance with Stapleton's jam, "Tennessee Whiskey", and Timberlake's most countrified record "Drink You Away"... and boyyyyy listen! They went IN! I loved every moment of this, and I'm reminded why Im such a fan of both of these guys. Check out the full performance below! The "Drink You Away" set is PERFECT! It's the second song.